Free from all Fear! 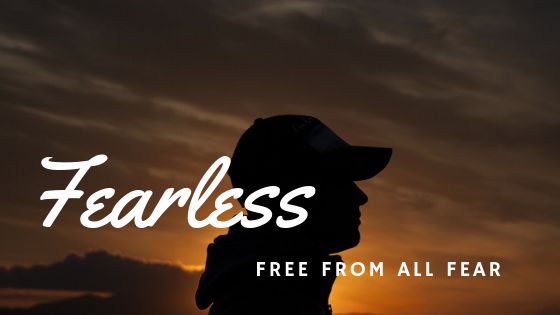 Psalm 34 – Is Fearless Living Possible? Anxiety disorders are the most common mental illness in North America. For many people, living free from fear is an unrealistic expectation. Is fearless living possible? What would it look like? In Psalm 34, David hands us the key to overcoming all fear. Believe it or not, there are more than one hundred phobias people experience. Many we can easily relate to: acrophobia (the fear of heights), ophidiophobia (the fear of snakes), mysophobia (the fear of germs, and arachnophobia (the fear of spiders). Fear can sometimes cause us do unusual things. Fear can be positive. In fact, it is essential to our survival! Fear warns us of impending danger. A certain amount of fear increases adrenaline flow helping us perform demanding tasks better. I read once that Alfred Nobel awoke one morning to read his own obituary in the local newspaper: “Alfred Nobel, the inventor of dynamite, who died yesterday, devised a way for more people to be killed in a war than ever before and he died a very rich man.” The obituary should have been for his brother, but in error Alfred’s name appeared instead. Alfred was afraid this would indeed be the assessment of his life so he initiated the Nobel Peace Prize, the award for those who foster peace! Fear led Alfred Nobel to rewrite his life’s work! There are 365 bible references encouraging us, to be courageous. One for every day of the year! The bible is full of accounts of God’s ability to use even the fearful, however. — you of little faith? For the majority of the world’s population concern for the basic essentials of life is constantly present! The wealthy minority worry about protecting their possessions, a secure retirement, the next vacation, and pursuing dreams. Many in Jesus’ audience were struggling daily for survival. All sufficiency is in God alone. He can and does give us the ability to create wealth and wisdom to know how to use it, but ultimately everything is His and comes from Him. “Lord! I’m bursting with joy over what you’ve done for me! My lips are full of perpetual praise. so let all who are discouraged take heart. Join me, everyone! Let’s praise the Lord together. Let’s make his name glorious to all. and he answered me. He freed me from all my fears! When did David write such joy filled praise? When he was afraid! To escape from Saul’s death threats David ran toward Achish king of Gath. Because David was famous for his military exploits, hiding wasn’t easy! “David … was very much afraid of Achish king of Gath. In the midst of justifiable fear, David “sought the LORD.” Relief came! Courage was restored! He was courageous not because he chose to be brave, but rather because he sought God in the midst of his fear. The LORD, Jehovah, the self-existent, all powerful, eternal God is big enough to wipe away all fear and circle his trembling ones with protection. In Him is unrattled security! Let’s be honest, being afraid is something we all face. In agreeing with David’s assessment of our “poor” condition, we rightly position ourselves before God who fiercely defends, protects and supplies us with needed courage. When fear is centred in God alone, there indeed is freedom. Fearless living is possible after all!